Besides Windows Live Spaces and Flickr, users who are using the photo management and sharing application, Windows Live Photo Gallery, can make use of this service to upload digital photos directly to their Facebook account. 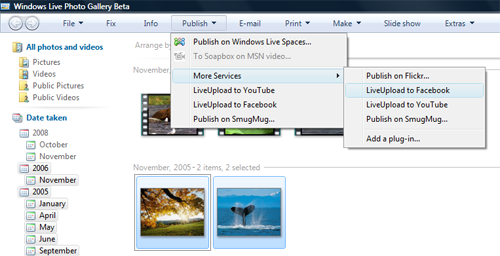 Windows Live Photo Gallery features photo management, tagging and searching capabilities. Using Windows Live Photo Gallery to do direct uploading can save time and users can also utilize the features available such as tagging ability, etc. 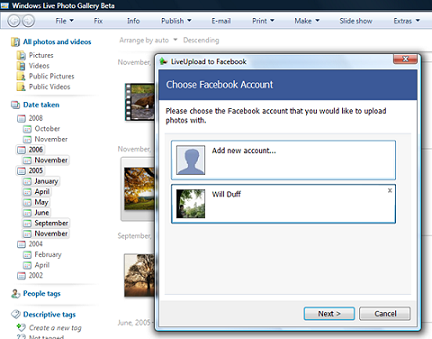 To make Windows Live Photo Gallery work with Facebook, users need to install LiveUpload, a useful plug-in for the Windows Live Photo Gallery. The LiveUpload plug-in is free and it can be downloaded via the link here. After downloading it, users need to close the Windows Live Photo Gallery program before installing it. Once it is installed, users will find a new tool, LiveUpload to Facebook, added under Publish > More Services at the Menu bar. Click on to the tool to link the Facebook account to the Windows Live Photo Gallery application via the step-by-step wizard. First time users need to create a new album for Facebook. Once it is created, users can start the image uploading to Facebook via Windows Live Photo Gallery. It is fast and convenient. Users can opt for one of these: Facebook will either automatically accept the request or users will need to give confirmation when the photos are transferred from Live Photo Gallery to their Facebook account.